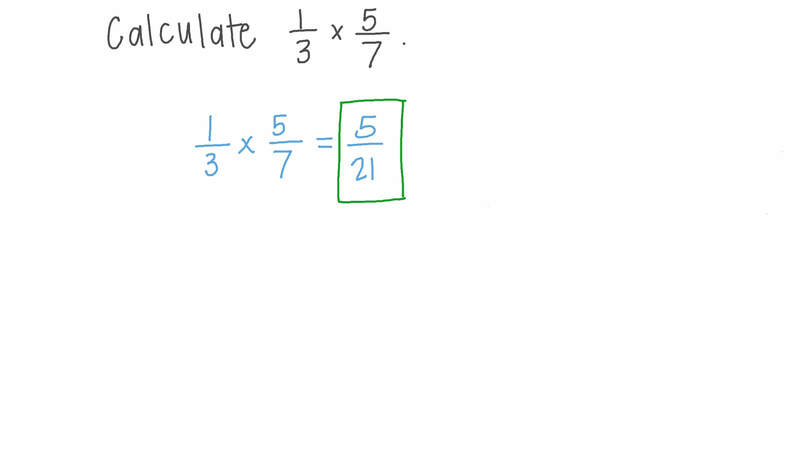 In this lesson, we will learn how to multiply up to three fractions and how to use this skill to solve problems in real-life situations. The results of a survey show that 6 7 of the population of a certain town jog regularly. Of those, 1 2 jog along the river. 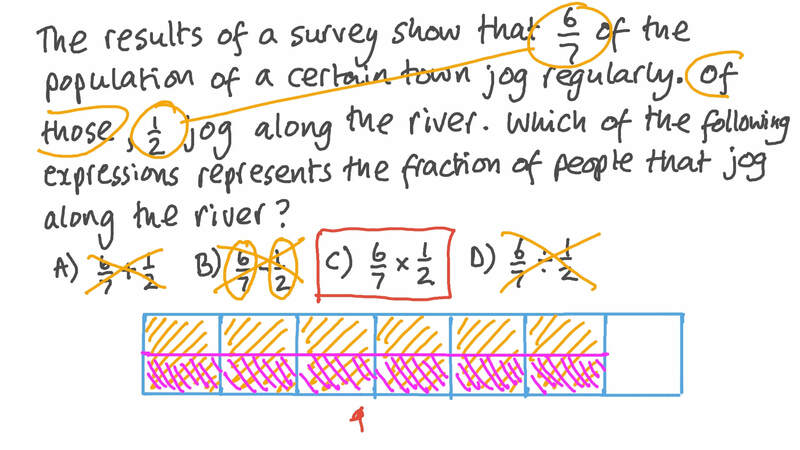 Which of the following expressions represents the fraction of people that jog along the river? Calculate 2 5 × 3 4 , giving your answer in its simplest form. Calculate 1 3 × 5 7 . Calculate 2 1 4 4 × 6 7 × 1 1 1 2 , giving your answer as a fraction in its simplest form. 1 4 1 5 of 3 7 = . A librarian is categorising the 950 books in his library. He finds that 3 5 of the books are religious, 3 1 0 are literature, and 1 1 0 are science books. How many literature books does he have in his library? There are 60 students in a class, 3 4 of whom are boys. 3 5 of the boys have blue eyes. How many of the boys do not have blue eyes? In the sixth grade, 8 9 of the students participate in sports. Of these students, 2 7 practice football, and of them, 1 4 practice swimming as well. If there are 252 students in the sixth grade, determine how many students practice both football and swimming. Evaluate 2 3 × 3 4 × 1 7 . Evaluate 1 4 × 2 3 + 5 4 × 2 3 − 3 × 2 3 . 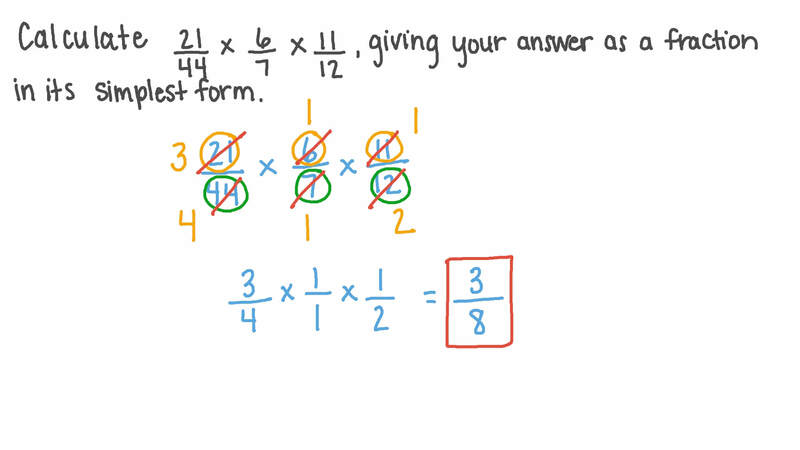 Evaluate 1 2 × 4 3 + 3 8 × 4 3 using the properties of multiplication. 8 9 × ⋯ 9 = 4 0 8 1 . Find the missing term in the equation 1 2 0 = 1 5 × ⋯ 8 . A bake sale is selling brownies. Currently, the brownie pan is 5 6 full. Jacob asks to buy 1 4 of the available brownies. How much of the entire pan will Jacob buy? Eight-fifths of a quarter = . 1 2 × = 1 6 . Evaluate 5 1 6 ×  1 3 − 7 5  . A half is a third of it. What is it? Find the volume of a wooden box that measures 2 3 5 by 3 1 8 by 3 1 2 feet. Sherif wants to paint his bedroom wall that is ft long and ft wide. Determine the area of the wall.